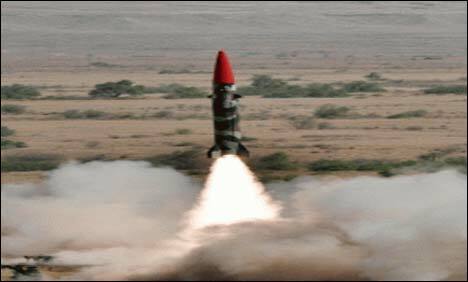 Pakistan has successfully test-fired long-range Hatf IV (Shaheen 1A) ballistic missile, Media News reported Wednesday. According to Inter Services Public Relations (ISPR), Pakistan successfully conducted the launch of the intermediate Range Ballistic Missile Hatf IV Shaheen-1A Weapon System. The missile is an improved version of Shaheen-1 with improvements in range and technical parameters. It is capable of carrying nuclear and conventional warheads. Today’s launch, whose impact point was at sea, was witnessed by Director General Strategic Plans Division Lieutenant General Khalid Ahmed Kidwai (R), Chairman NESCOM Muhammad Irfan Burney, Commander Army Strategic Force Command Lieutenant General Tariq Nadeem Gilani and other senior military officers, scientists and engineers. DG SPD Lieutenant General Khalid Ahmed Kidwai (R) congratulated all scientists and engineers on the successful launch, and the accuracy of the missile in reaching the target. He said that the improved version of Shaheen 1A will further consolidate and strengthen Pakistan’s deterrence abilities. He appreciated the efforts of all personnel for their dedication and professionalism.